Sep14September 14, 2012 • By gentlecrafter • This entry was posted in Card making, Ideas, New products, Tools and techniques and tagged acetate, bigshot, card, embossing, foil board, paper, vellus, wallpaper. Bookmark the permalink. Do you know if this is possible with your technique? I dont have the materials, and I’m hoping someone could help me make some? Interested? Thank you for your compliment. Your site looks quite interesting. Yes you can do this with the bigshot although it will be limited in size to 4×6″. You could perhaps do this with a large acetate/overhead transparency by placing on top of a silicone sheet or the reverse of a mouse mat. 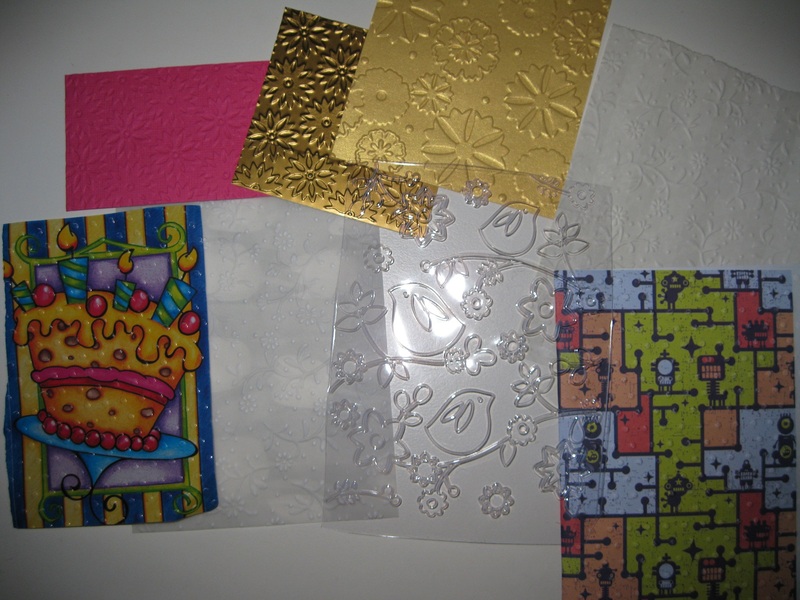 Print a dotted pattern on a printer and place between the acetate and the mat and then use an embossing tool to make the indentations in the acetate. Alternatively if you can find someone with a large big shot (the 12″) variety you could get a large sheet much easier.